Welcome to Cape Town… the most romantic city in the world and your starting point on the World’s Greatest Romantic Adventure – South Africa. From her iconic Table Mountain framed against the blue sky to her colorful bustling harbor, Cape Town warmly embraces all who visit her shoreline. Enjoy guided sightseeing of this delightful city by day, and return, in the evening, to your luxurious hotel. Next up: wing to one of South Africa’s greatest wildlife refuges, a private game reserve in the Greater Kruger Park. Perfect for nature lovers and photographers, the itinerary features superb game viewing on a private reserve for 5 days and 4 nights. Your reserve boasts all the ‘Big Five’ – lion, leopard, elephant, rhino and buffalo, and guests will experience daily game drives in open land rovers, conducted by professional rangers and trackers. The high energy of the day melts away as twilight settles over the bush and our special guests will enjoy a romantic dinner-for-two. Served in your own private outdoor ‘sala’, camp staff will discreetly conjure up a delicious candle-lit feast under the starry canopy of the African night sky. On arrival at Cape Town Airport you will be met by a Great Safaris Guide who will assist you to the vehicle for the private transfer to your elegant waterfront hotel. Your explorations begin a half day tour of the city highlights and a visit to the Cape Town Diamond Works and a late afternoon / sunset cruise. Your time in Cape Town also includes a full day tour of the Cape Peninsula, which includes a visit to the penguins at Boulders Beach and a full day tour of the Cape Winelands which includes a stop at Cheetah Outreach. Bring your camera as you do not want to miss capturing your personal cheetah encounter. Fly via Johannesburg to Hoedspruit, gateway to the Greater Kruger Park, where you are driven to your private reserve safari experience. Your four days are filled with early morning and late afternoon game drives in seach of the Big Five, escorted by a professional guide in specially designed open vehicles. Time spent in the bush can be a truly magical experience. 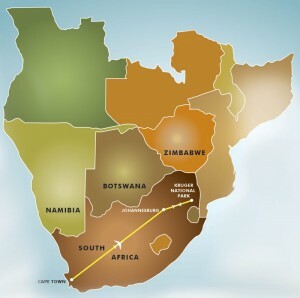 A final game drive followed by breakfast before being transferred to Hoedspruit Airport for your flight to Johannesburg, arriving in time to connect with your outward flight and bid “farewell” to Africa. With fond memories and photos of the World’s Greatest Romantic Adventure – South Africa! After five exciting days in the Cape, exploring so many new sights, I loved the change of surroundings when on safari. A whole different World! Our Ranger was so educational and entertaining. I will not forget how close we came to the Cape Buffalo herd, and I loved the wonderful sight and sounds of the birds. But the memorable surprise was to see the San people ancient art and rock painting. So well preserved, it was an art gallery in the Veld!